Reserve quantity is being used . Refuel as soon as possible . Vehicle running on natural gas. When the indicator lamp or lights up, the auxiliary heater and fuel-powered supplementary heater switch off automatically. 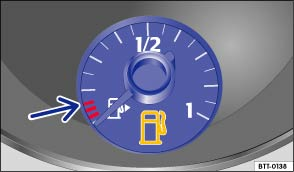 The indicator lamp or lights up, if both fuel types (petrol and natural gas) have reached the reserve level. The indicator lamp lights up if the vehicle is running on natural gas. The indicator lamp will go out once the natural gas tank is empty. The engine switches to petrol mode. 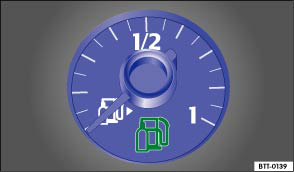 Things to note: If the vehicle is parked for an extended period directly after refuelling, it may well occur that the pointer for the natural gas engine does not indicate the fuel level shown directly after refuelling. This does not mean that there is a leak in the system, but rather that for technical reasons the pressure has been decreased in the natural gas tank following a cooling phase directly after refilling. The steering, all driver assist systems and brake assist systems will not function if the engine sputters or stops completely due to a lack of fuel or irregular fuel supply. Always refill the fuel tank when it is still 1/4 full. This reduces the risk of running out of fuel and breaking down. Do not run the tank empty. Irregular refuelling periods could cause backfiring and allow unburnt fuel to enter the exhaust system. The catalytic converter or diesel particulate filter could be damaged as a result! The small arrow next to the petrol pump symbol or in the display instrument shows you which side of the vehicle the tank flap is located on.